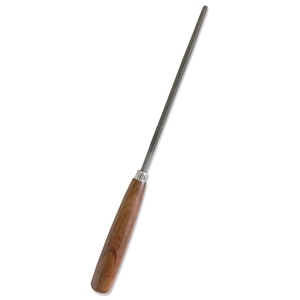 This imported file-rasp, cylindrical in shape, is ideal for fine rasping of stone and wood. The rasp is made from carbon steel for durability and has machined cutting edges around the tool. Its tang is set in the beautiful exotic hardwood handle tightly secured with a ferrule. The rasp is approximately 8" in length; the tool with handle is approximately 13" in length.